We are dedicated to providing free genealogical and historical information on the internet. Your county coordinator is Dale Grimm, and my ancestors settled Fayette County around 1818 near Good Hope and in 1835 around Madison Mills. You can reach me by clicking the "Contact Us" link at the top of any page. 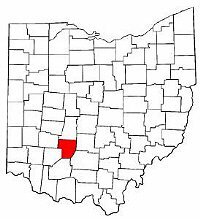 The Ohio Legislature passed an act authorizing the organization of Fayette County on February 19, 1810, taking land from parts of Ross and Highland counties. The county was named in honor of the Marquis de Lafayette, a French officer who aided the colonists during the Revolutionary War. The county seat is Washington Court House. The Post Office added "Court House" to distinguish us from the myriad of other communities named in honor of George Washington. Genealogy is all about sharing. If you have information or resources relating to Fayette County, we would love to hear from you. Just click the "Contact Us" link above. Conversely, anything you find here may be used for any non-commercial genealogical or historical purpose. Kindly acknowledge your source. Nothing contained on this site may be reproduced for any commercial or "pay" genealogy service. You can find ANY Ohio county easily by using http://[county].ohgenweb.org and inserting the name of the county you wish to visit. © OHGenWeb Project. All rights reserved.